Want to track Santa’s progress as he delivers presents around the world? You’re in luck! You can follow Santa Claus on his Christmas eve deliveries around the globe right on an iPhone or iPad, and it’s super easy! That’s it! Santa’s current location will be shown on the world map. He moves around quick though so refresh or search again to see where he has gone to deliver gifts to next. There’s also an official NORAD tracking app with a goofy game, but the actual tracking is still done within the Maps application. 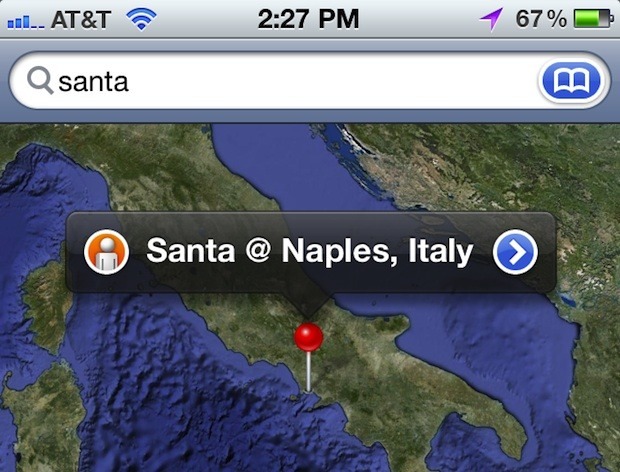 Or you can track Santa at noridsanta.org with any device that has a web browser. However you want to surveil Santa, you can do that. As you might have guessed, you can also use the standard browser-based Google Maps to search for and track Santa’s location on your Mac or PC. Doesn’t work on my iPhone, neither on Maps on the Mac. Comes up with a lot of addresses with the word “Santa” in it. :-( Maybe the guy is done working already?! Christmas is over Greg. That’s why.